The voice and guitar of Dire Straits, the label on the record proudly states, and you have to wonder if Mark Knopfler will ever truly get out from under that gargantuan shadow he himself cast all those years ago. My guess is he won’t, although I applause the man for trying. Tracker is his eight solo album, and it’s not bad. Not bad at all. 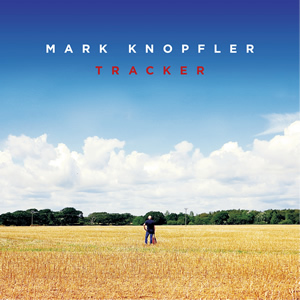 I sincerely believe Knopfler is an integer, and perhaps stubborn man. The 65 year-old Glaswegian Could probably make oodles of money by phoning in halfway decent rock music and have it released under the Dire Straits moniker, but he consciously chose not to. That takes balls, and results in a varied solo discography consisting of album which give you the feeling Knopfler recorded for himself rather than an audience. A good musician should do that, I suppose. Tracker is a continuation of 2012’s Privateering, which in itself was the seventh in a line of increasingly laid-back, moody records full of quiet folk songs and little rock. It’s the same on Tracker. It’s also not a very long album, clocking in at fifty-odd minutes, but it’s long enough and never outstays its welcome, which is a good thing. Sure, it could have done without a rather brainless ditty like Skydiver, during which Knopfler really hams it up with an abundance of steel guitar, silly lyrics and a cheesy sing-a-long chorus, but it’s the only misstep on an otherwise fine record. The biggest problem Tracker has, and I’d like to stress that I’m not saying this as a jaded fan of early Dire Straits, is that the album starts with Laughs and Jokes and Drinks and Smokes, plods on a bit during the course of ten songs before it sort of fizzles out on Wherever I Go, with nothing remarkable happening in between. In some ways, Tracker is more reminiscent of what Knopfler composed for films like The Princess Bride and Wag the Dog; it’s pleasant enough to listen to, but it doesn’t really do anything particular without the accompanying visuals. For me, the highlights of the album consist of Basil, which is a moody, brooding folk song which reminds a bit of the quieter moments on Sailing to Philadelphia, and Silver Eagle, basically a song in the same vein. As the old saying goes, “two good songs do not a good folk album make,” Tracker is not bad but certainly falls short of impressive. Actually, I don’t know if that’s a real saying, but let’s pretend it is anyway. The album plods on a bit too much and nothing remarkable happens along the way. It’s folky with a hint of blues, and lick of country music and a heap of that very distinct voice and guitar of Dire Straits. Make of that what you will. This entry was posted in RP and tagged 2015, blues, Country, Dire Straits, folk, Mark Knopfler, Mercury Records, review, Tracker. Bookmark the permalink.